Montana allows you to complete your divorce without an attorney if you and your spouse can come to an agreement on what to do with your property and how you will care for any children that you have. To file for divorce in Montana, either you or your spouse must have lived in Montana (or have been a member of the armed services stationed and residing in Montana) for at least 90 days before the divorce is filed. A couple can obtain a no-fault divorce in Montana on the grounds that the marriage is irretrievably broken in that there is serious marital discord, which adversely affects the attitude of one of the parties toward the marriage, and there is no reasonable prospect of reconciliation. Both spouses sign a Joint Petition for Dissolution and his or her own Declaration of Disclosure of Assets, Debts, Income and Expenses, which are filed with the District Court Clerk. A hearing date is scheduled and both spouses must sign a few additional documents. 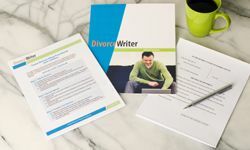 DivorceWriter provides forms specific to the state of Montana and offers a money back guarantee if your documents are not accepted by the Court. Summary dissolution, which is similar to filing a joint divorce as explained above, but generally requires fewer documents, may be an option. You can get a divorce through a summary dissolution proceeding only if ALL of the following conditions exist on the date you file the Joint Petition for Summary Dissolution. The total fair market value of your and your spouse's assets, excluding secured obligations, is less than $25,000. A debt is secured when the debtor's promise to pay the debt is backed by specific property if the debtor does not pay the debt. For example, your car can be taken by the bank to pay the debt if you miss a payment. This means that your car loan would be a secured debt. Both spouses have read and state that they understand the contents of the summary dissolution booklet; and Both spouses want the court to end the marriage. You have qualified to use DivorceWriter to complete your Montana divorce papers online. Select "Continue" to start the interview.